Expect Miracles Foundation and its Miracle Maker Leadership Council (MMLC) proudly presented a total of $24,000 to grantees of the 2014 MMLC Funding Awards at a reception held at the Boston Marriott Long Wharf on April 30th for MMLC members and their guests. As 75% of the funding from the Miracle Maker Leadership Council is directed to The Belfer Institute for Applied Cancer Science at Dana-Farber Cancer Institute, Dr. Kwok-Kin Wong, M.D., Ph. D. Scientific Director of Belfer Institute emphasized the importance the MMLC funding has had on the Belfer Institute and thanked the donors for their support, recognizing the important discoveries that have been a result of the MMLC funding. The other portion of MMLC donations are used to aid innovative organizations and programs which have the passion and potential to make a difference, but lack the resources. The MMLC Program is not designed to assist in funding large institutional/national/society entities, but rather local, grassroots, community organizations that are in a period of growth. The MMLC supports organizations where the funding award has the ability to materially impact an organization or program and to further the MMLC’s mission. 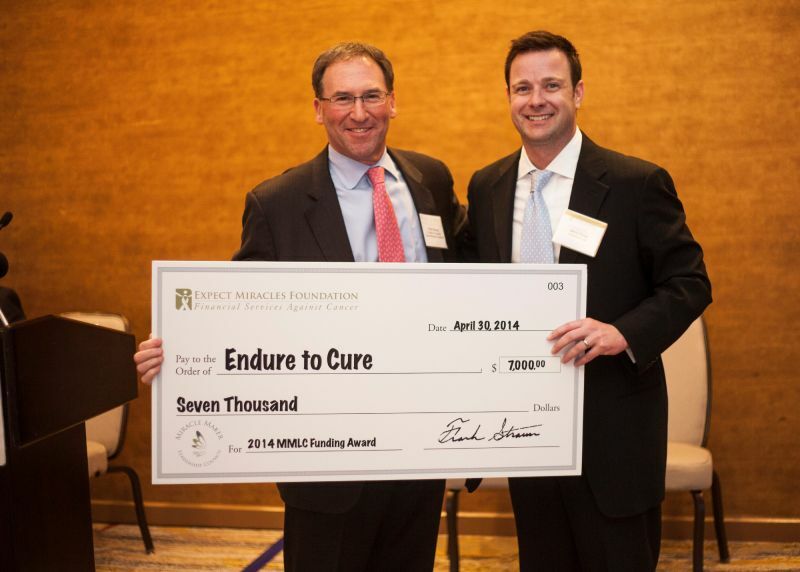 Frank Strauss, Founder & Chairman of Expect Miracles Foundation presented the first funding award in the amount of $7,000 to Jason Sissel of Endure to Cure. Jason thanked the MMLC for the funding and explained that grant will expand the "Small Miracles" program, which provides customized gifts and experiences that brighten the life of a child going through cancer treatment. Funding will provide 100-175 more children with customized and group "Small Miracles” consisting of Edible Arrangements, non-hospital meals, iPads, ice cream making classes, and more. Don DeBolt, MMLC Co-Chair took to the podium to present the second $7,000 funding award to The SAMFund for the 3rd year in a row. Samantha Watson accepted the award and emphasized that their grant will expand on the Webinar Series supported in the past – developing a 6-month project designed to help young adults manage their financial health after cancer. The grant will specifically support the development of an interactive resource, more targeted Webinars, hard copy materials, and other online tools to help young adult survivors improve their financial literacy and receive more information specific to their financial decision-making. The Miracle Maker Leadership Council (MMLC) was established to empower the Foundation's top donors to have a more personal and significant role in the impact of their gifts. The MMLC is a select group of current and future leaders in the financial community whose mission is to direct funding to cancer fighting causes where such support in not always readily available. The MMLC is funded through individual contributions from MMLC members, who congregate annually to review grant applications, deliberate, and select funding award recipients. 3-year annual pledge, and/or make an online donation.